Picture a diamond shape sparkling with such brilliance it was once only fit for royalty. This elegant diamond shape has a long and fascinating history steeped in romance and desire. The eye-shaped marquise-cut diamond is a rose by many names such as the “football-shaped diamond”, and the “boat-shaped cut” or the “Navette”. It is adored by those who appreciate a diamond with rich history that highlights glamorous jewelry pieces with distinct fire. Marquise diamonds feature a unique eye-like shape that gives them one of the largest surface areas of any diamond shape. This diamond shape features a total of 58 facets, featuring 33 on the crown and 25 on the pavilion. These facets (at times) feature a French tip that replaces the large bezel facets at the points of the diamond with star and upper girdle facets. Known for its long and narrow pointed shape, the marquise-cut is essentially a modified brilliant diamond and, as a result, appears larger than it actually is. Similar to the emerald-cut, a marquise diamond makes the wearer’s hands and fingers look longer and slimmer. What is the History of the Marquise-Cut and Why is it Called That? Eighteenth-century French king Louis XV originally coined the diamond shape’s name. Louis XV commissioned the marquise-cut to resemble his chief mistress’s lips. She was the Marquise of Pompadour, and Louis considered her lips to be “perfectly shaped”. Often, diamond cutters also refer to the marquise-cut as a “Navette” shape (meaning “little boat” or “little ship” in French) as the shape appears to resemble the hull of a small ship. Marquise: a hereditary feudal title above a count and below a duke. Football: a popular nicknamed due to this cut’s elongated, pointed shape. With a history rooted in the most elite of Old World aristocracy, the traditional nature of the marquise-cut fits beautifully on a ring finger and is a classic, refined choice for an engagement ring. What Should I Look for in a Marquise-Cut Diamond? Length-to-Width Ratio: This is a subjective matter, however, the ideal, industry-recommended length-to-width ratio for the marquise-cut is 1.90. Table Size: Ideally, a marquise-cut diamond features a large table for excellent light reflection. No Distinguishable Bow-tie: Because of their narrow shape, every marquise diamond contains some semblance of a bow-tie. However, a well-cut diamond should have no visible dark area running through its center. Symmetry: The two points at either end of a marquise-cut diamond should align with one another. This helps to avoid an off-balance or skewed appearance in the jewelry setting. Proper Setting to Avoid Chips: The sharp ends of a marquise-cut require a setting that protects the diamond’s defined edges from chipping. We highly recommend that you select a setting with prongs that protect the most susceptible points of this cut. For added security, we suggest using “V-tip” style prongs. Incorporated in 1985, GSL functions as an independent laboratory for unbiased, professional diamond grading. GSL inspects each diamond under closely controlled lighting and viewing conditions to determine diamond grades. Their trained grading professionals use highly-calibrated measurement devices to capture important data for use in determining the square diamond’s quality. GSL uses specialized scales to ensure accurate weight measurement of every diamond. Using the carat system, experts measure each diamond to the hundred-thousandths of a carat. Since one metric carat equals 0.2 grams, it is best to have highly-trained specialists use properly calibrated tools to determine diamond quality. 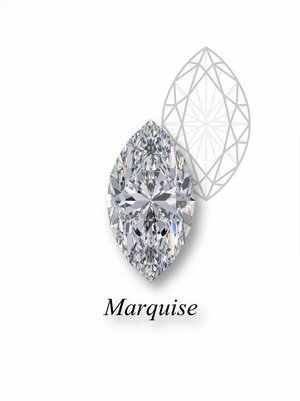 Marquise-cut diamond clarity references the appearance of the stone, and it notes any blemishes or inclusions. The GSL grades square diamond clarity as one of six grades – Flawless, Internally Flawless, Very Very Small Inclusions, Very Small Inclusions, Small Inclusions, or Imperfect. So, much of diamond selection comes down to personal taste. In fact, some blemishes may only be visible to professional using specific equipment. Evaluating the clarity of a diamond can be as simple as noting whether or not it appears clear to the naked eye. You may prefer to know that your marquise-cut diamond is certified as Flawless while others may not mind minor blemishes that aren’t visible unless inspecting them with special equipment. If your partner prefers a more ideal appearance, opt for a Flawless or Internally Flawless diamond. If small imperfections do not stand out to your partner, then you may prefer a Very Small Inclusions or Small Inclusions grade marquise-cut. We recommend using the GSL ratings for clarity to better understand your preferences for marquise-cut diamond clarity. The industry standard system for grading marquise-cut diamond color begins with a D grade (colorless) and continues with increasing levels of color to a Z grade. Diamonds are compared to master stones with known color grades. In fact, GSL utilizes master stone sets that are chosen based on rigorous standards then tested prior to use. Master stones help experts determine diamond color grades. At GSL, each master stone set must surpass rigorous standards before use in determining color grades. The human eye associates diamond color with overall diamond size and its settings. The human eye may not detect small differences in diamond color which account for significant differences in diamond price. Additionally, the setting color and material chosen for the marquise-cut diamond can make a considerable difference in the color of the diamond. Their long history of antique appeal often inspires buyers to opt for warmer colors in marquise-cut diamonds instead of completely colorless varieties. Easily calculate the length-to-width ratio of a particular marquise-cut diamond by dividing the stone’s length by its width. Industry experts tend to agree that the classic marquise-cut shape should have a length-to-width ratio between 1.75 and 2.15. Similarly to other more unique diamond cuts, preferences regarding a marquise-cut remain entirely subjective. For this reason, we recommend spending time evaluating a variety of marquise diamonds to determine your preferred ratio. While less popular in the diamond industry at-large, jewelers often use the marquise-cut on other precious stones. The shape is usually used in fine jewelry, most notably for engagement rings. Due to this cut’s rarity, refined essence and historical connotation, celebrities like Ashlee Simpson, Victoria Beckham, and Catherine Zeta-Jones often favor the marquise-cut. The marquise-cut is Old World-elegance exemplified. These unique, almond-shaped diamonds feature the largest surface area of any diamond shape, making them appear larger than other cuts. The marquise-cut is also an ideal cut for those who prefer a striking engagement ring that slims the fingers with glamorous appeal. To find your diamond fit for a queen, browse Zales marquise-cut jewelry.